While being careful not to meddle in the internal affairs of the local Church, Renewal Ministries Fellowship recognises the responsibility we have to our members and those associated with them to provide avenues for healing and restoration where sin and conflict have wounded the body of Christ. We assert that God's scriptural discipline of ministers and others who have fallen is always with a view to repentance, forgiveness, release and restoration - never with a purpose of rejection, ostracism, isolation or ex-communication. See to it, brothers, that none of you has a sinful, unbelieving heart that turns away from the living God. But encourage one another daily, as long as it is called Today, so that none of you may be hardened by sin's deceitfulness. We have come to share in Christ if we hold firmly to the end the confidence we had at first.(Heb. 3:12-14). 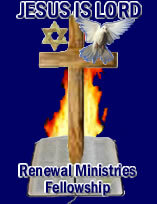 If any person suspects that a member of Renewal Ministries Fellowship has become caught in a sin or doctrinal error that is destructive to both their walk with God and the health of the body of Christ (see also our Policies and Procedures - Working with Children Policy, Sexual Abuse Policy, Vilification, Harassment and Bullying Policy, Spiritual Abuse Policy, Financial Policy or Position Statement on Sexuality) that person is to first pray about the situation and take it to our Father for His direction and dealing with it.